If you have been following for a while you know how much I love my fermented food like sauerkraut, kombucha or miso paste. Not only I think they all taste delicious but they contains live bacteria (probiotics) which have been proven to help support our gut health. 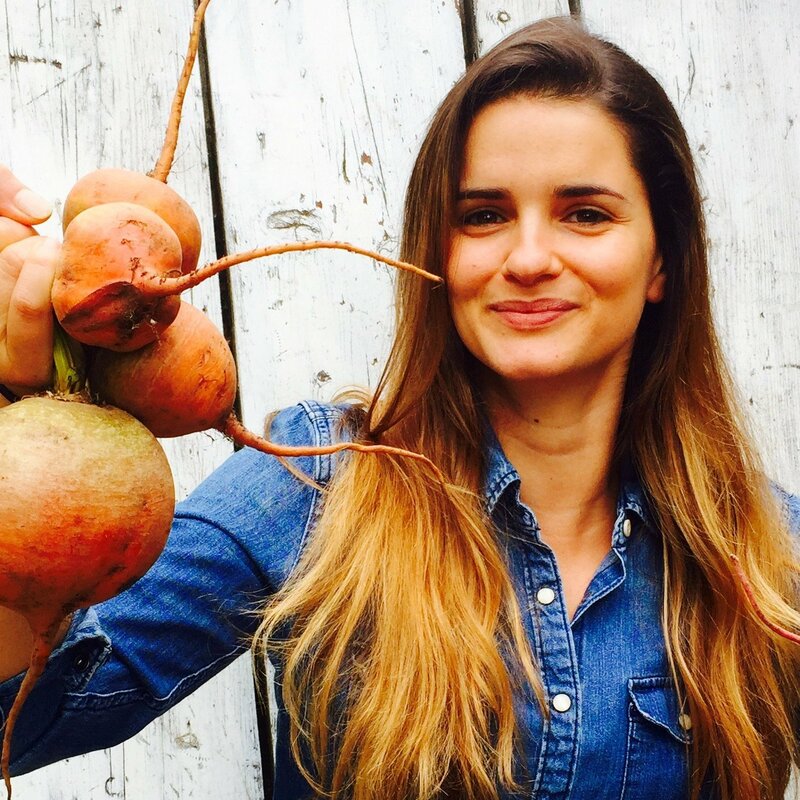 We all have heard how important our gut health is for our overall wellbeing but why is that exactly? To remain healthy our bodies rely on trillion of microbes, altogether called Microbiome. These friendly bacteria are key to our good health as they support healthy digestion and immune health. They help protect our gut lining and keep it healthy so that we can absorb the nutrients from our food and keep toxins out of the bloodstream. 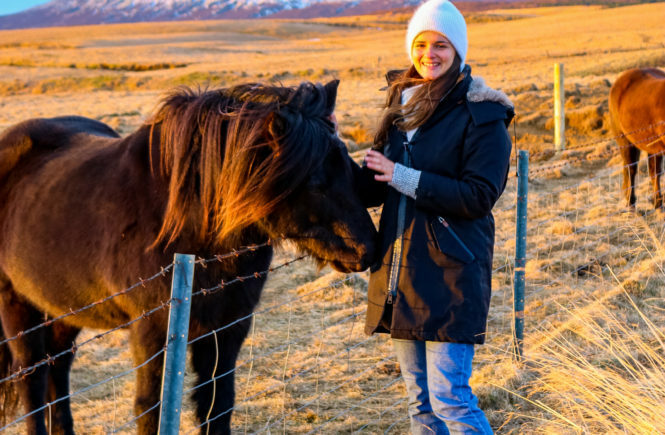 In addition to supporting healthy digestion and regular bowels, friendly live bacteria produce beneficial compounds such a short chain fatty acids, certain vitamins and amino acids. They also play important role in bolstering immunity as 70% of the immunity system is found in the gut. They are many potential reasons why people might not get enough friendly bacteria, from birth all the way through adulthood. Babies born by C-section do not get their first dose from their mother during birth, and formula-fed babies miss out on the live bacteria in breast milk. 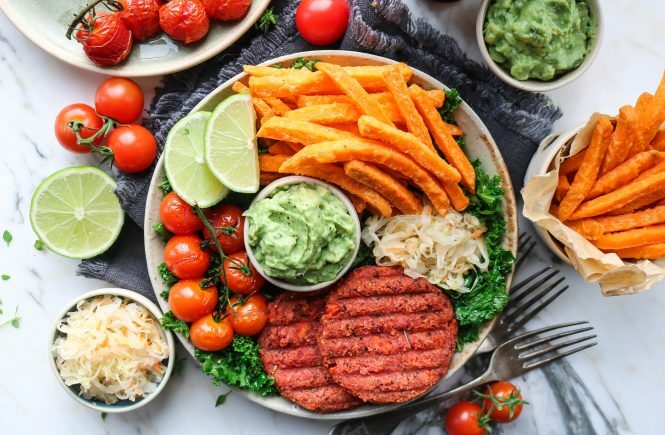 The modern diet is also not kind to our micro biome with chlorinated water, alcohol, antibiotics, prescription drugs, stress and chemicals all killing off these bacteria in our gut. If the friendly gut bacteria dies off unfriendly bacteria can take over and cause gas, bloating and irregular bowels as well as compromising overall health. When my skin started to break out 6 years ago after coming off the contraceptive pill I went to see various dermatologists and they all prescribed me different type of antibiotics which unfortunately they failed miserably and probably made my skin flares up even worse. They also probably weakened my gut flora which is the last thing you want for clear skin! As well as changing my diet and lifestyle I also started to research on how could I have helped even further my skin to finally regain its balance. One thing that kept popping up in all my online researches was that a healthy gut is also very important for a healthy and clear skin. Few searches more down the line and I put on my brave face and tried my first bite of sauerkraut (i promise you, its gets better) and sip of kombucha pretending it was like drinking prosecco. As well as introducing fermented food a regular basis into my diet I also started taking probiotics and I can honestly say that the effects had been remarkable. The GI tract and skin are both organs of detoxification. We need a healthy microbiome in the gut to break down food, absorb nutrients, and eliminate toxins. When our gut flora is not healthy, and there are more bad bacteria than good bacteria, a lot of problems can arise — including chronic inflammation, which is a cause of acne and other skin problems. Some bad bacteria, fungus, and yeast can even cause inflammation in and of themselves. So, if you are looking to clear up your skin, you might have to start with your gut. 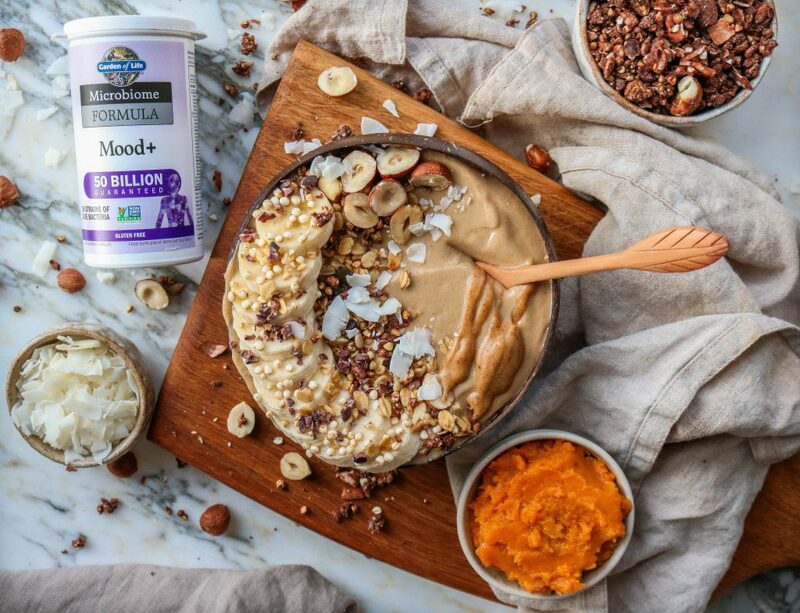 When it comes to buying probiotics they are obviously tons of options out there, I would suggest ti invest in probiotics with a very high number of live bacteria, 40 billion or more. 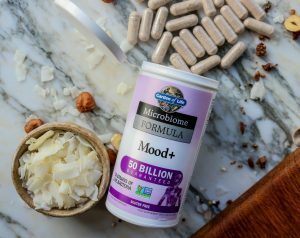 I have recently started using Garden of Life Microbiome Formula Mood + which contains 50 billion live bacteria. 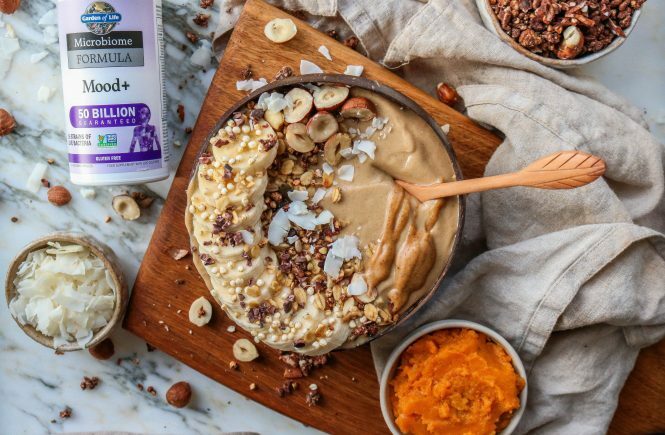 Garden of Life rather than using commonly used probiotics, inulin, they use USDA organic and non GMO project Verified acacia as it comprises 90% soluble fibre. This means that it has a better digestive tolerance and therefore supports the growth of bacteria and helps reinforce the gut lining. 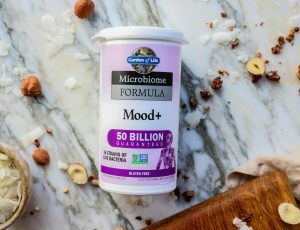 Microbiome Formula Mood + also contains organic ashwagandha and organic Alaskan blueberries which also help to support emotional health and manage chronic stress. are a type of fiber. They are un-digestible plant fibers that already live inside the large intestine. The more food, or prebiotics that probiotics have to eat, the more efficiently these live bacteria work and the healthier your gut will be. Other probiotics food are avocado, onion, garlic, jerusalem artichoke and liquorice root. 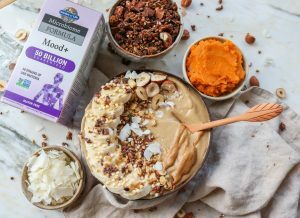 This super creamy smoothie bowl is not just super good for you and your gut but it’s also ridiculously delicious! 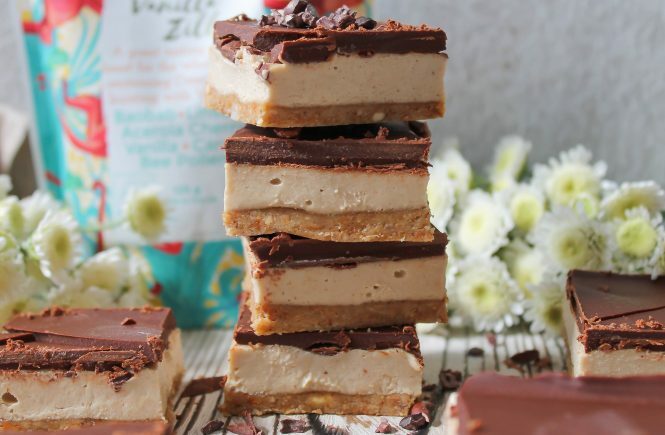 Super creamy and fluffy with a decadent salted caramel taste. You can also add 1 capsule of Garden of Life Mood + but just gently opening the capsule and pouring the powder into the smoothie. Simply place all the ingredients into a blender and blend until you have a creamy and thick ice cream kind of consistency. You might need to add a bit more almond milk if your blender is struggling. I like to keep my smoothie as thick as possible so I try not to add too much liquid. Top with your favourite toppings and enjoy straight away!